You will meet our representative with cab at the pre-decided pick up location at Ernakulam and we will move ahead for our Kochi Tour. The distance between both the cities is of just 14 km. After check-in at the hotel we will go to explore the parts of our Kochi tour like Fort kochi tour and Cochin Backwater day tours. You can enjoy the cool breeze and splashes of sea water at Cherai & Vypeen Beach or Andhakaranazhi Beach. 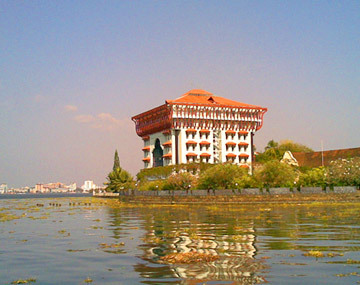 Chinese Fishing Nets, Willingdon Island, Santa Cruz Basilica, Bolgatty Palace and Mattancherry Palace are the other major attraction of the Kochi tour. Evening can be well spent either at Marine drive or by going for shopping on famous streets of Cochin. Stay overnight in the hotel at Cochin. Drive to Kumily from Fort kochi is of around 3 hours as the approximate distance you have to cover on this route is of 115km. At your arrival you will be checked in to the hotel. Kumily tours will bring you closer to nature as the place is surrounded with dense forests and lush greenery. By afternoon we will take you to visit various places like Abraham’s Spice Garden, Vandiperiyar, Murikkady and Idukki Arch Dam. Stay overnight at hotel. In the morning, you will be taken to Periyar Tiger reserve to enjoy the jungle safari where you will get to find many wild animals and will be around wild flora and fauna. Have the lunch in the afternoon and after that we will go to Mullaperiyar Dam. By the evening you can enjoy boat ride or bamboo rafting in the periyar river. Enjoy your overnight stay at hotel or resort with bonfire. The average distance that you have to cover on your road trip from Periyar to Munnar is of around 100 km which can be covered within the journey of 3 hours. While heading towards Munnar tour you will find plenty of cascading waterfalls on the way like Aathirappally Waterfalls, Vallara & Cheeyapara falls and road would be surrounded by lush greenery and enticing valleys. Our representative for Tour Packages to Munnar ensure that none of the amazing places are left out on the way to this hill station. In evening, the best place to go is Pothanmedu View Point where you can find an amazing sunset view. Overnight stay at hotel in Munnar. Have the breakfast and then we will go to visit various places included in your Tour package to Munnar. If you like to go for trekking then we can towards our Anamudi Peak which is the highest peak in western ghats or Meesapulimala. At your Munnar holidays you will also get the chance to visit beautiful places like Rose Garden, Echo Point, Top Station, Photo Point, Blossom Park, Mattupetti Dam, Atukkad Waterfalls, Kundala Lake and Marayoor. After exploration of all these places with our Munnar Tour Packages we will head back towards Emakulam. There our representative for Kerala holiday packages would drop you at the airport or railway station as per your convenience. Are you wondering where to go on your next trip so that you can embrace the nature more closely? Then need not to worry as we have got a perfect trip planned for you under our package of Nature. trail which covers Kochi tour, Kumily tour, Periyar Tiger Reserve and Munnar tours. This tour package is of four nights and 5 days where you can spend a quality time with your friends and family. This tour package to Munnar starts with the exploration of City of Cochin to the valleys of Kumily and from wilderness of Periyar Tiger Reserve to exotic hills of Munnar. Our Kerala tour packages not only takes care of your cab and hotel booking but also takes you to the places which are not much explored by tourists. We look forward to take you to the destinations which are a perfect getaway for the lovers of nature.